Bangalore: Indian apparel brand majors such as Madura Garments, Arvind Mills Ltd and Raymonds Ltd, which constitute the bulk of the organized retail market, are aggressively promoting international brands as they eye higher profit margins. While Arvind sells brands such as Nautica, Lee, Wrangler, Kipling and Jansport, Raymond retails brands including Zambaiti, UCO Denim, Ring AqvaPlus, GAS, Fedora, Ansell and Talabot. Madura Garments distributes Espirit, Arrow, Louis Philliphe and Allen Solly. The reasons why Indian apparel majors are pushing international brands instead of their own are not hard to seek. Higher margins, not having to invest in creating a new brand, plugging a gap in their portfolio, especially at the top end and potential positive rub-off effects on their own brands are the key reasons they cite. Famous brands: A Nautica showroom in Bangalore. Arvind sells brands such as Nautica, Lee, Wrangler, Kipling and Jansport. 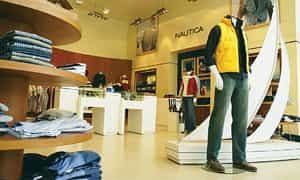 “The presence of an international brand also has a rub-off effect on home-grown brands in terms of retail operations because of the halo effect," adds Dhruv Bogra, business head, Nautica. This is part of VF Arvind Brands, a joint venture between VF Corp. and Arvind. Pradeep Agarwal, managing director, Prateek Group, an apparel manufacturer which has a licensing agreement to retail Kanz, a German kidswear brand, says that “from the production and styling point of view, the home-grown brands benefit a lot." But a halo effect only applies to brands that are already established in the minds of current and future shoppers here in India, notes Suresh of Arvind. “Though Arrow was a leading brand in the US, when we introduced it here 15 years ago, it was built from scratch," he recalls of one international brand that still had to be developed as a new brand in India. Licensing agreements with international brands could also help strengthen domestic brand portfolios, especially in women’s apparels, premium- relaxed clothes and accessories. “In categories like kidswear, sports wear and lingerie Indian consumer still does have much choice, in terms of design and quality, so it makes sense to partner," says Prateek’s Agarwal. Meanwhile, international brands are also keen to enter the Indian market because of the potential it still offers. “The market opportunity for luxury brands is Rs6,500 crore and is growing at 20-25% annually. Apparel is a big chunk of it," according to Asitava Sen, vice- president, retail and consumer goods, Technopak Advisors Pvt. Ltd. “Brands like Gucci, Jimmy Choo, Laperla, Build a Bear and Tumi are either here already or looking to enter."